When you think of doing a BBQ, grilling vegetables usually doesn't jump to the front of your mind. But it should. Vegetables on the grill are easy to prepare, especially if you have some simple grilling accessories. The end result is a different taste and texture as compared to preparing vegetables the traditional way in the kitchen. What types of vegetables can you grill? The list is really endless. 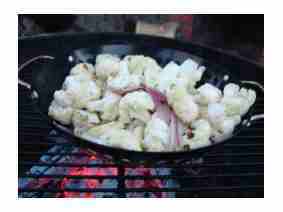 Asparagus, onions, mushrooms, cauliflower (pictured above), squash, zucchini, potatoes, corn on the cob, eggplant, green and red peppers, basically nothing is off limits when it comes to grilling vegetables. You can even grill certain fruits. Below are links to detailed instructions. Leave Grilling Vegetables and Return to BBQMyWay Homepage.